Prepare the couscous according to the package. Meanwhile, in a bowl, combine the flour, curry powder, and 1/2 tsp. salt. Add the chicken and toss to coat. In a large non-stick skillet, heat 1 Tbsp. olive oil over medium-high heat. Add the chicken and cook, turning once, until browned and just cooked through, about 5 minutes. Transfer the chicken to a plate. Add the remaining 1 tsp. olive oil to the skillet and heat over medium-high heat. Add the onion and celery and cook, stirring, for 3 minutes. Add the cherries and 1/2 cup water and bring to a boil. Stir in the evaporated milk and chicken along with any juices; season with salt. 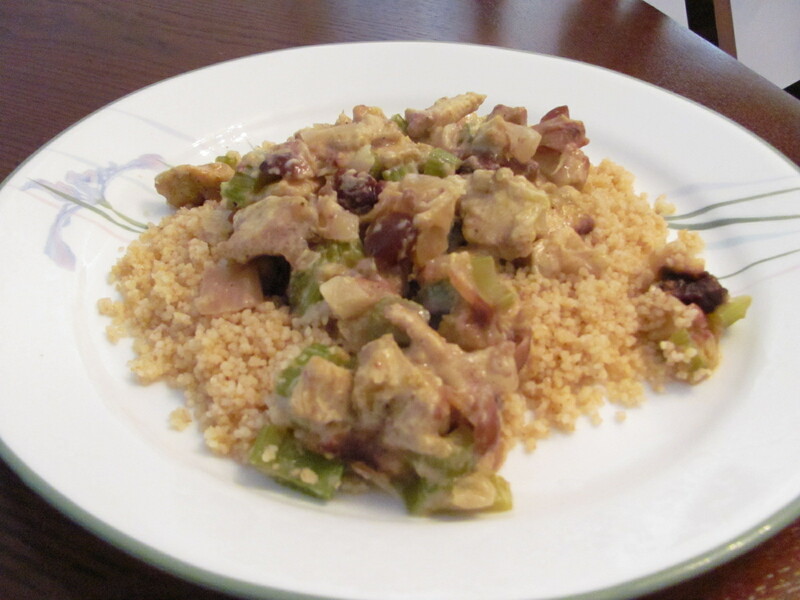 Serve over the couscous and top with the celery leaves. I realized as I was typing out the ingredients list that I used boneless skinless chicken breast instead of thigh… oops! I really should read all the way through a recipe before making it… I thought it tasted just fine, although I guess next time I’d probably try it with the thigh meat just to see what it’s supposed to taste like!